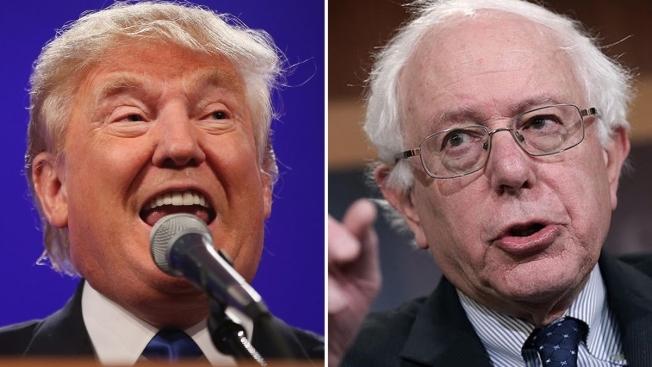 Donald Trump, left, and Bernie Sanders. The snowstorm that hit New England harder than almost anyone had anticipated on Friday even caught some presidential candidates off guard. Donald Trump, who is leading the Republican field in New Hampshire, held several events in New Hampshire on Thursday. But he apparently left the state on Thursday night and was unable to make it back for a scheduled Town Hall on Friday morning at the Londonderry Lions Club. "Due to weather and the airports being closed Mr. Trump is unable to attend today's Town Hall at the Londonderry Lions Club," read an email from his campaign. "This event will be rescheduled and additional details will follow." Jeb Bush, one of Trump's Republcian opponents, couldn't let the moment pass without getting a jab in at the frontrunner. He replied to Trump's tweet about the postponement by noting that his 90-year-old mother, former First Lady Barbara Bush, was able to make it to New Hampshire to campaign with him despite the snow. Trump is scheduled to be back in New Hampshire on Saturday, and also has events scheduled on Sunday, Monday and Tuesday, which is New Hampshire primary day. Another candidate whose schedule was impacted by the storm was Democrat Bernie Sanders, the leading Democratic candidate in New Hampshire polls. Sanders held events in Manchester and Exeter on Friday, and is scheduled to attend the New Hampshire Democratic Party's McIntyre Shaheen 100 Club Celebration on Friday night in New Hampshire. But he was also scheduled to hold a 2:45 p.m. press conference in Exeter to annnounce a new endorsement from "a prominent civil rights leader." But due to the weather, the featured guest was delayed. Instead, the press conference was changed to a press call at 4 p.m.
At least one candidate seemed to be enjoying the snow. Republican John Kasich engaged in a snowball fight Friday with members of the press, caught on video by CNN's Teddy Schleifer. Kasich also tackled a supporter in the snow after the impromptu snowball fight.